A fun thing to do for Super Bowl Sunday is to make treats for the gang. 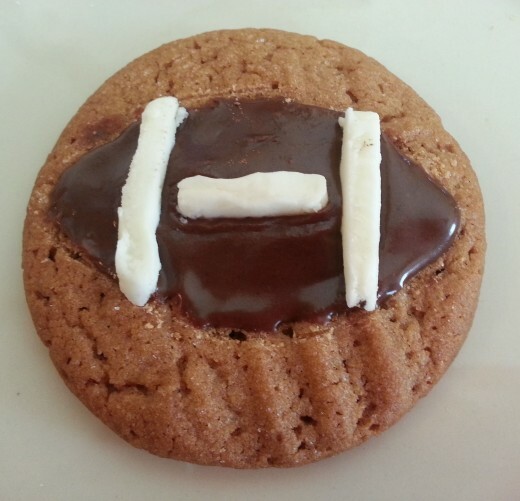 I thought it would be fun to make my own creation of a football decorated on top of peanut butter cookies. So I attempted to do just that. I cheated and didn’t make the cookies from scratch. I used one of those store bought packages and followed the directions on the package to make them. I did, however, make the frosting by scratch. I made just enough frosting for a few cookies. I’ve never done that before so getting the measurements right was a little tricky especially the powdered sugar. Basically just a teaspoon of melted margarine and cocoa, then a tablespoon of milk and ½ tsp or less vanilla. I used 4 tablespoons or more of powdered sugar. I finally got the consistency to where I wanted it to be. You don’t want it to runny or thick. It turned out good except the taste. I wasn’t sure what I missed for taste wise but overall it still worked just fine for making a football on the cookies. My fiancée helped with the football design. He suggested I print a little football out online to use as an outline. It worked great. 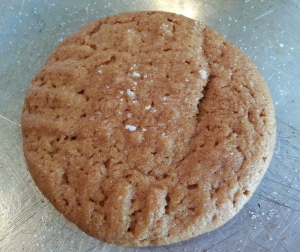 I used a butter knife to lightly make an outline on the cookie. I then frosted the football on the cookie. Then for the white strips we used the frosting cream from the middle of an Oreo cookie. He cut the frosting into little strips and then I put them on the football. There you have my football cookie creation. It was fun to make! 1. Shape about a teaspoon of dough into a ball. 3. Place them about 2 inches apart on an ungreased cookie sheet. 1. Mix together margarine and cocoa. 3. Add powdered sugar. Mix thoroughly. *You may need to add a little more powdered sugar so it’s not too thin. This frosting recipe is for a few plus cookies to start with. To frost a football on more than a few cookies of course you’d you have add more of each ingredients. Four baking items that are essential to making cookies and frosting is baking sheets, spatula, measuring spoons and mixing bowls. How clever to use the Oreo creme for the stripes on the football! These will look really pretty on a Super Bowl party dessert table!